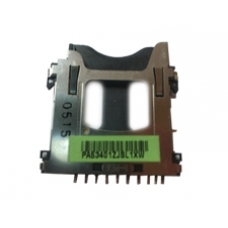 Buy an replacement SD card socket assembly for the iPAQ HX2000 Series. This part is required if you are replacing a broken or faulty SD card socket on an iPAQ main logic board. This component is suitable for repairing SD card socket related problems. Replacing the socket corrects faults including broken SD card locking mechanism and damaged read / write pins inside the socket. The SD socket is mounted directly on to the iPAQ main logic board PCB and requires soldering skills, a hot air soldering iron is recommended for the replacement procedure.